No, I'm not talking about the Grammy nominated hit song by Robin Thicke. I am talking about living in a time where the line between reality and science fiction is rapidly disappearing. When I was a high school science fiction enthusiast in the seventies, there were very clear distinctions between the world I lived in and the imaginary worlds I read about, watched on TV or in the movie theaters. 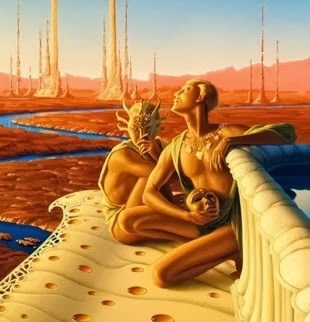 In 1950, Ray Bradbury wrote "There Will Come Soft Rains," a haunting story featured in his masterwork, "The Martian Chronicles." The reader of the story enters a vacant house where robots continue to function, even though the inhabitants are dead and gone. Breakfast is automatically made, clothes are laid out, and voice reminders of daily activities are called out. Robotic mice vacuum the home and tidy up. When I first read the story, 20 years after it was written, none of the technology depicted even existed. But in 2014 you can program your toaster and your coffee machine to make your breakfast, be reminded of upcoming appointments by your smart phone, and have your house cleaned by a Roomba. "By 2014, electroluminescent panels will be in common use." YES. Electroluminescent panels are the thin, bright panels used in retail displays, signs, lighting and flat panel TVs. "Gadgetry will continue to relieve mankind of tedious jobs." YES. "Communications will become sight-sound and you will see as well as hear the person you telephone." YES. "The screen can be used not only to see the people you call but also for studying documents and photographs and reading passages from books." YES. "Robots will be in existence." YES. IBM computers have defeated chess grand masters and Jeopardy champions. As a human, I am beginning to feel diminished. Things are changing very quickly. You can easily see what's coming around the bend in the very near future. To me, it's a short step from 3D printing jewelry and handguns to having a home appliance that prints out my lunch. Sometimes it feels like the only thing left to conquer is outer space. But then again, I recently heard a scientist explain that our belief that we cannot travel faster than the speed of light will eventually be shown to be as wrong as our earlier belief that we could not exceed the speed of sound, or run a sub 4 minute mile. Fortunately, I recently learned something that made me feel a lot better. My neurologist brother told me that he had just come across a 2005 article in "Scientific American" that discussed a study showing that "when you spot a celebrity on a magazine cover, your brain recognizes the image in an instant - an effect that seems to occur because of a single neuron." Simply put, your brain assigns a single neuron for every person you recognize. We can afford to do this, because recent research has demonstrated that we have about 86 billion neurons. So we have plenty to spare. Now this is where it gets amazing. In 2012, after a great deal of work, scientists were able to get 16,000 interconnected computers to recognize just one thing - a cat. Seems that the sentient, self aware computer of science fiction is not here yet. We can take a breather.